Welcome to the website of The European Association for South Asian Studies (EASAS). EASAS is a charitable, academic association engaged in the support of research and teaching concerning South Asia with regard to all periods and fields of study. 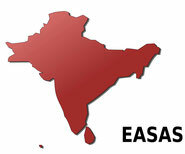 The objectives of EASAS are to promote South Asian Studies in all countries of Europe. publication and distribution of a Newsletter for members. The council of the EASAS consists of the executive board which is constituted by the president, the vice-president and the treasurer, and in addition, of an advisory committee with at least six and at most nine other individuals reflecting the various academic disciplines represented by the Association as well as the regional specialisations of the members. EASAS members with voting rights elect the council for a two-year period.